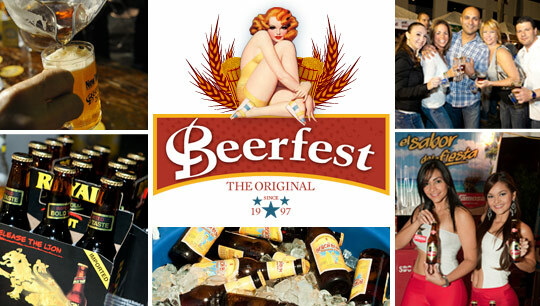 The 15th-annual New Times "Original" Beerfest Presented by Isle Casino Pompano Park returns to new venue Huizenga Plaza, 32 E. Las Olas Blvd on Saturday, March 31, 2012, from 6 to 11 p.m.
Beerfest offers more than 100 of the world's best local and international beers, live music from the Dirty Dozen Brass Band and Jacob Jeffries Band on the REVOLUTION LIVE stage, live performances by the Miami Heat Dancers and signer/songwriter Jimmi Heart, the men's college basketball championship games on large screens, good food and great times! Radio personalities Stugotz and Hochman from the Dan LeBatard Show on 790 The Ticket will host the event and a portion of the proceeds will benefit the Children's Starlight Foundation. Opt for the VIP Experience in the VIP lounge and enjoy unique craft beers only available in VIP, unlimited liquor samples, food samples from some of Fort Lauderdale's best restaurants, premium stage views, giveaways, and more. A 15th anniversary specialty brewed beer will be created by BX Beer Depot and available to VIP guests exclusively. Unlimited local and international beer sampling from 100+ vendors, live from Dirty Dozen Brass Band, college basketball viewing area on large screens and special offers from local merchants. Unlimited liquor samples, food samples from some of Fort Lauderdale's best restaurants, unique craft beers only available in VIP, premium stage views, giveaways, and more. A 15th anniversary specialty brewed beer will be created by BX Beer Depot and available to VIP guests exclusively. Please Note: Advance tickets sales are available until 2pm on March 31, 2012. Tickets for both General Admission and VIP are limited. This is a 21+ event. © 2019 New Times BPB, LLC, All rights reserved.